The biggest time waster in my studio, though it usually happens after the artists leave, is trying to lay the tracks down quickly and then compensating for what I consider poor recordings later (I could just get it right at the source, am I right? ), but lately everyone I’ve been recording has seemed to be in a rush. I think that if I spend 15-20 minutes auditioning and getting a great snare or guitar sound that I’ve been wasting everyone’s time (I don’t charge at all yet, so their money isn’t an additional issue) and I don’t seem to trust myself or my recording space quite enough to get that great sound to begin with. Is there a way that you can suggest to speed up the mic/position auditioning process, at least for getting started and convincing everyone that slight adjustments are worth the time spent? I’ve considered showing the drastic differences that phase, position, and mic selection can make through boring technical demonstrations, but that never seems to be enough when dealing with people that have almost no recording experiences to reference; I even find it difficult to hear those subtleties myself under the pressure of tracking! Though the differences seem completely obvious to me when I’m in the mixing phase. Hmm..I struggle with the same thing. Preparation is huge. I had a session recently where the headphone amp I set up wasn’t working. I forgot I had rewired some things in my studio and hadn’t wired that, thinking I’d “get to it later.” I start setting up for the session, and the artist arrives and I’m not done. I eventually run a long headphone cable and we record, but I was flustered and sweaty and didn’t really spend too much time on figuring out tones because it was time to move on. So…I’d say have as much as humanly possible set up BEFORE the artists arrive. That means if you want to try two different mics, have them set up and routed, tracks created, etc. That way you can have everything ready to go when the artists arrive. Combine good expectations with good preparation, and you should be good to go. On top of good session preparation, you should also be prepping yourself to be able to mix those tracks you record like a champ. 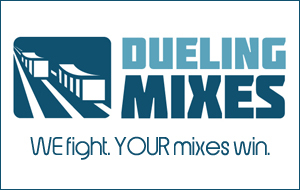 Dueling Mixes can help with that. It’s like ongoing prep work that makes you look like a rock star.